Kale Chips? Eat a Bunch! One bunch of kale. Mine is from my Riverdog Farm CSA box. Tear leaves off stems; I run my fingers from tip to stem end and the leaves fall off into just about the right size pieces, about 3-4 inches. Wash and dry very well, preferably in a salad spinner. 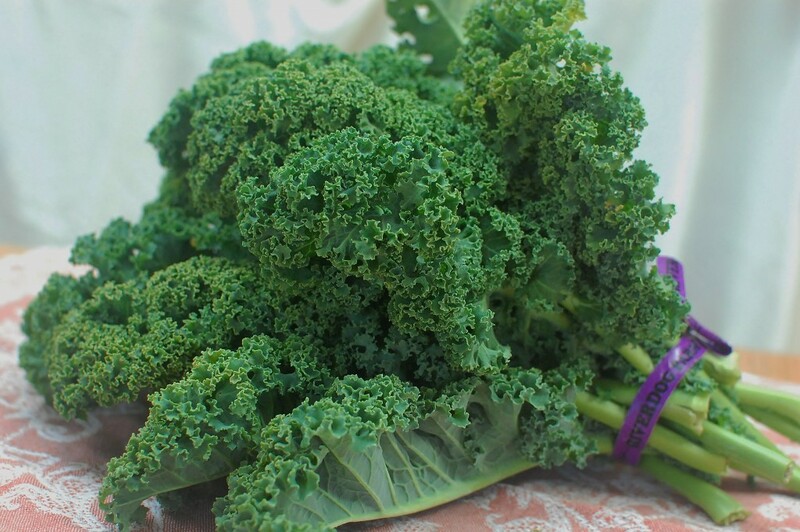 Divide one bunch of kale between 2-3 trays so the leaves are not too crowded. (Line the pan with parchment for easier cleanup if you like). Toss leaves on each tray with 2-3 teaspoons olive oil and about 1/4 teaspoon kosher salt. Bake 15 minutes on convection setting at 275°F, turning leaves after 10 minutes. On convection, 2-3 pans can be baked at once. Bake 25-30 minutes on conventional setting at 300°F, turning leaves every 10 minutes. On conventional, it is better to bake one pan at a time for better circulation. 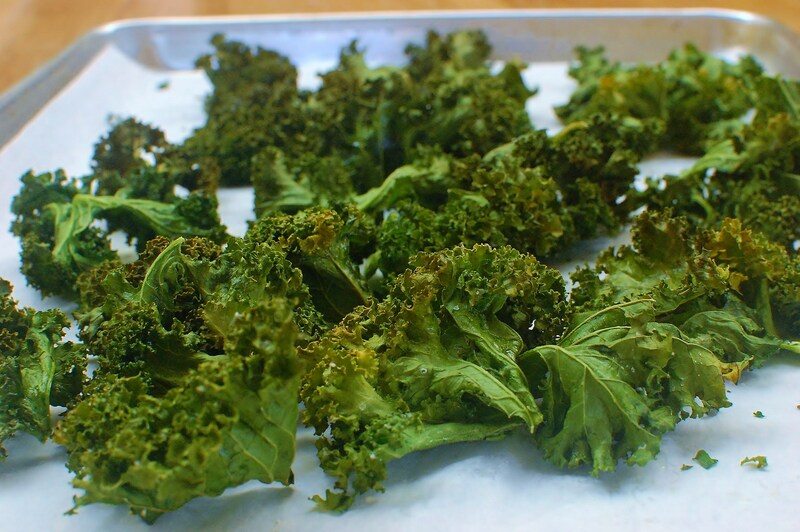 Kale chips are best fresh from the oven, but should stay crispy in a covered container for about 2 days. I bet they won’t last long enough to get to a container! “micro-chips” make the chips in the microwave: Prep the same as above; arrange single layer on a plate and microwave 3 minutes. Check for crispness and add additional 30 seconds as needed. 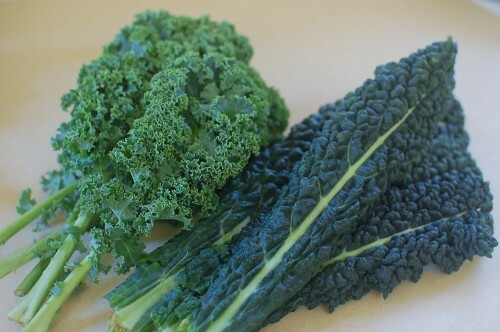 Lacinato kale also called Tuscan or Dinosaur kale (right) makes good kale chips too. I’m going to try the lacinato kale. Seems it might be easier to do, and look more like “chips”. Though it probably needs to bake a bit longer, right?. I found the time was pretty similar for lacinato kale, but let me know how it works for you Rita! 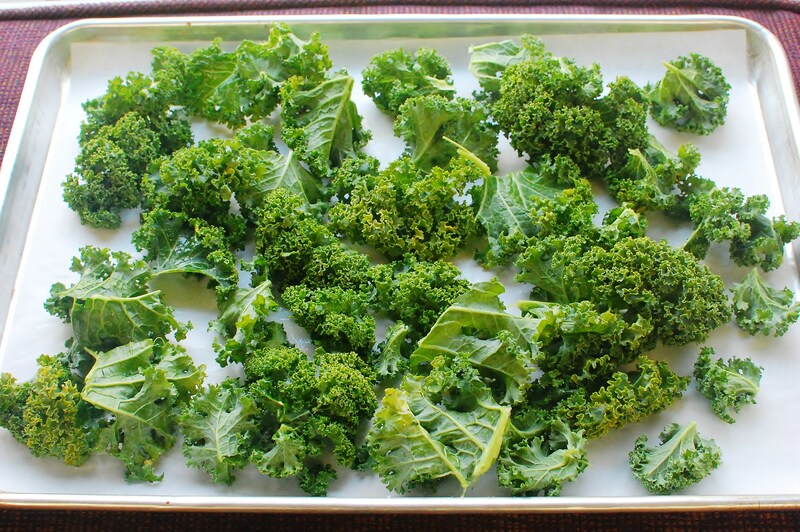 An even easier way to do kale chips is in the MICROWAVE! Cooks Illustrated had an article on this, just prepare as you would for a conventional oven. Spread in one layer on a plate, microwave on full power 3 minutes. If not all the way crispy, microwave more in 30 second increments. It is not only quicker, but I find that the chips are more evenly cooked. Neat! I will try it and report back. Thanks for the tip Lisa! LOVE how the micro-chips! I tried with Lacinato kale. What a perfect kids snack too, that they can make in a jiffy. Thanks Lisa! These are delicious!!!!! I usually just add a little salt, no extra seasoning necessary. Thanks for the reminder, I’ll make a batch of these this week. Happy to remind you about these chips Steve!